Top: Put some camarónes on the barbacoa: That’s Spanish for put some shrimp on the barbie (photo courtesy Eat Wisconsin Cheese). Center: Fresh-caught shrimp from I Love Blue Sea/Vital Choice. 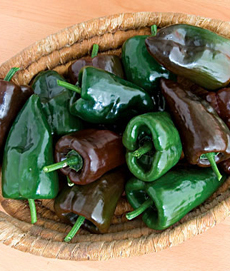 Bottom: Poblano chiles (photo courtesy Burpee). 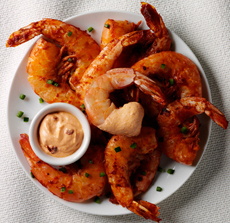 May 10th is National Shrimp Day, celebrating America’s favorite seafood. Here’s a Mexican-style recipe, courtesy of EatWisconsinCheese.com. You can serve this dish warm or chilled—perhaps with a warm grain or a room temperature or chilled grain salad, plus dressed greens. *Available in the Latin American foods aisle of most supermarkets. 2. MIX the sour cream, lime juice and 1 tablespoon of adobo sauce in a small bowl. Pour into a small serving dish. Sprinkle the poblanos over shrimp to garnish. 1. 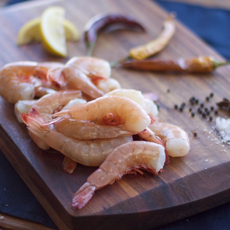 THAW the shrimp slowly in the refrigerator beginning 24 hours before you plan to cook them. Place the container in the refrigerator on a low shelf—if not in a sealed bag, then covered lightly with plastic wrap. Then remove any liquid that has collected in the container and use the thawed shrimp within one day. NOTE: Keep all raw foods on the lowest shelf and cooked foods on higher shelves to prevent any contamination from raw juices dripping onto cooked food. 3. QUICK THAWING TECHNIQUE: If you can closely monitor the shrimp, place them in a leak-proof plastic bag (if it is not in one already.) Submerge the shrimp in cold tap water and change the water every 30 minutes until the shrimp has defrosted. Do not try to hasten the process with warm water or hot water because the shrimp will begin to cook. Cook immediately after thawing. Adobo is a Mexican spice blend: spicy and rich in flavor, but not too hot. As with chili powder, Chinese Five Spice, curry powder, jerk spice and other spice blends, the ingredients and proportions will vary somewhat among manufacturers and home cooks. Traditional adobo blends contain black pepper, cayenne, cumin, garlic, onion and oregano. They have no added salt (but check the label). You can buy the dry spice mix, or ready-made, canned chipotles in adobo sauce. Traditional uses are as a rub, along with lime juice and a bit of salt, on grilled chicken, fish or pork. It is added to chili recipes and taco fixings, and used to season guacamole. You can buy adobo ready-mixed, or can blend your own. For the latter, try 2 tablespoons granulated garlic, 1 tablespoon salt (optional), 4 teaspoons dried oregano, 1 teaspoon black pepper, 2 teaspoons cumin, 2 teaspoons onion powder and 2 teaspoons cayenne, ground chipotle or other chile powder.